Besides layering, wearing fur is another favorite thing I love about fall/winter. There is something quite lush and cozy about fur whether it be a giant fur coat or furry mittens. We spent the last weekend at our old stomping ground, Santa Cruz, and the gloomy weather was perfect for fur so I wore not one but two furry pieces! My new La Volta Deluxe wedged booties by Koolaburra are the comfiest and fluffiest thing ever! Despite how edgy they look, they are incredibly comfy especially with the sheepskin lining. I seriously thought I was wearing slippers the whole time, no joke! To make the look more fun, I added this awesome Nila Anthony bag to the mix. 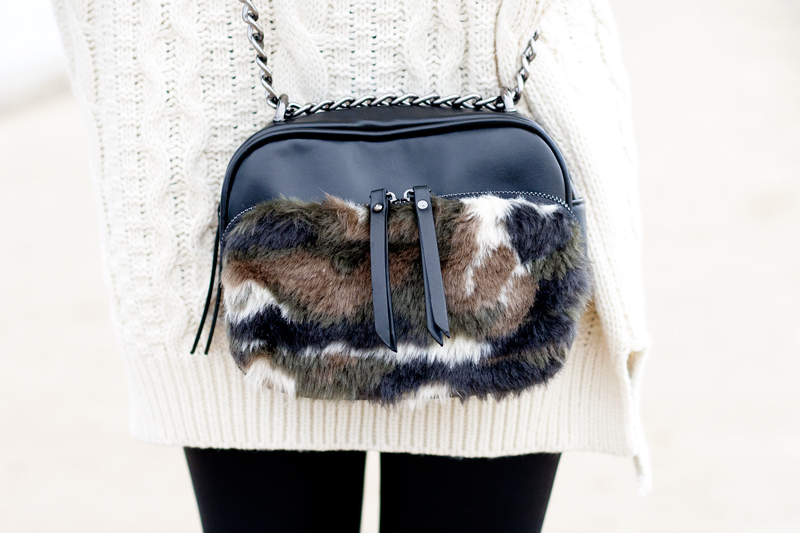 I love the mixed camo-like fur combined with the black leather and silver chain. Cozy, edgy, fun... what more can you ask for? La Volta Deluxe sheepskin wedged booties c/o Koolaburra. Camo faux fur handbag c/o Nila Anthony. Tanushka sunglasses by Selima Optique c/o DITTO.